"It is the reformer who is anxious for the reform, and not society, from which he should expect nothing better than opposition, abhorrence and even mortal persecution." THE person who envisioned an independent India with a vibrant civil society knew the odds were against directed social change. Half a century later, the leaders of the independent nation he helped build continue the tradition of hostility to reformers. The voluntary movement in India, which has become a force in terms of clout and reach in the 1990s, is facing the ire of those who prefer status quo. This has not come about suddenly. NGOs have been working at the grassroots as well as at the national level, and have been interacting with international funding agencies. This has led to tensions with the government, local politicians and administrators, as well as business, all of which feel insecure. A conflict of objectives between organisations has also resulted in internal tensions in the voluntary sector. Urban NGOS are accused of being 'elitist', while grassroots NGOS are called 'corrupt'. Divergence of opinion is an inevitable part of the growth of the movement. But those opposed to NGOS have tried to exploit these divisions and sought blanket controls over NGO activity. The aim is to curb dissent and divergent opinion altogether. The self-proclaimed 'guardians' of social values come in all forms political leaders, bureaucrats, welfare agencies and even militant groups. Persecution of voluntary agencies by powerful groups is nothing new. Activists have been roughed up in Bihar, women reformers have been attacked in Rajasthan, and social workers threatened by goons hired by vested business interests in other states. Activists have been seen as social deviants by the very persons who flout the norms of society. A clear rise in such cases occured in 1997. The trend became noticeable with the abduction and murder of social worker Sanjoy Ghose of the Association of Voluntary Agencies for Rural Development-Northeast (AVARD-NE) in Assam by the United Liberation Front of Asom (ULFA). Later, the banned People's War Group (PWG) forced NGO Samata to move out of the hill tracts of Visakhapatnam district, Andhra Pradesh (See boxes: Proxy Attack From Far Left and The Underground Factor). Samata was opposing a local mining project of a large business house on environmental grounds. In another instance, the Madhya Pradesh government banned the Adivasi Mukti Sangathan (AMS), an NGO working in the western district of Khargone, for empowerment of tribals. Even as Congress-i supporters of the deputy chief minister, Subhash Yadav, beat up AMS supporters, chief minister Digvijay Singh launched a tirade against NGOS. Singh said that he was requesting the Union government to route all NGO grants through the state government. The "economic offences" wing of the state police would be asked to check up on foreign donations received by NGOS (Times of India; October 20, 1997). He charged the AMS with extorting money from tribals and encouraging them to cut down trees. But media reports differed. It was alleged that the deputy chief minister's vote-bank in western Madhya Pradesh had been severely eroded by the growing strength of the AMS. (see box: Turmoil in Tribal Land). Politicians' nightmare Such instances highlight the paranoia of Indian politicians. This is probably because, as analysts point out, NGOS have played a role in opinon-making in state and panchayat elections. They say that though candidates supported by NGOs seldom win, they are able to influence voting patterns, often tilting the balance in favour of a candidate most likely to contribute to the welfare of locals and minorities. This was observed in the 1991 general election, and the state elections, especially in Madhya Pradesh and Bihar. Candidates supported by the environment and tribal movement contested the state elections in Madhya Pradesh in 1993, taking up issues such as forest and natural resource management. Not all NGOS have a clean political record. Certain NGOS in Karnataka, for instance, bankrolled candidates with dubious track record. Large parties were surprised to find 'small-time candidates' spending huge sums on election campaigns. Some activist groups have supported political parties that espoused their cause. In 1993, Gene Campaign supported the Samajwadi Party, which had opposed the entry of multinational companies in the Indian seeds market (Down To Earth, Vol 2, No 14). Since the 1998 general election, a network of voluntary organisations and people's groups such as the National Alliance of People's Movements has come up, projecting an electoral agenda for mainstream parties to take up. These developments have worried politicians as well as funding agencies. As a document prepared by an NGO umbrella organisation, the Voluntary Action Network of India (VANI), says: "Funding agencies... understandably become suspicious that their funds are being siphoned off to run an election." VANI director Anil Kumar Singh says that its member organisations have been advised not to contest elections. A 1995 VANI document cautions: "Voluntary organisations (vos) should not duplicate the political sector or get co-opted by it." The role of vos, it says, should be to support independent activists, to educate the electorate, and to facilitate free election and empower people. Apart from the indirect involvement of NGOS in opinion making, political parties are also uncomfortable with the former's access to funds for development. Getting a village road laid is no longer a legislator's trump card to get votes. Business as usual Insecure politicians have often joined hands with strong business interests to indulge in NGO-bashing. The attack on Samata in Vijayawada is one example. In Orissa, the nexus between corporate interests and the local administration has become apparent. The most recent example was the violence over bauxite mining and processing near Kashipur town in Orissa. The police allegedly resorted to lathi charge when the residents refused vacate the land meant for a proposed aluminium plant. The local tribals and dalits have organised demonstrations and blockades. Says Achyut Das, an activist of Agragamee, an NGO that took up the issue: "The companies have the tacit and unlimited support of the administration as also the power elite." On December 2, 1997, a gang attacked Agragamee field centre at Sunger, Kashipur. The following day, the same 'gang' burnt down the NGO'S field office at Kerpai, Kalahandi, says Das. There was an attack on a visiting television crew and on the jeep of another supporting the NGO by the mining lobby. This was followed by an attack by people of the antimining lobby on a field camp. Say Das: "The police arrested 20 pro-mining and 12 anti-mining people, though the main accused are still at large. On December 13, 1997, the police arrested 35 innocent tribals." The National Human Rights Commission will probe into the matter, it was reported. Says NGO activist John Samuel, in an appeal for support to Agragamee: "In the last six months, incidents of violence and atrocities against social activists all over the country have increased. Unless we question and seek to change the situation, it will be difficult for citizens or social activists to voice any sort of dissent in this country." SECURITY CONCERNS: A common allegation in political circles against NGOs is that foreign funds help them push the "agenda of the West" (read human rights and environmental issues). Home ministry officials say that pumping in huge amounts of money can influence the policy of a country. Politicians and bureaucrats also fear the influence of divisive forces through voluntary organisations. Says home secretary B P Singh: "One of the ways a country interferes in another country is through NGOs. This is known world-wide." The government is rightly worried about foreign funds being utilised for political and religious purposes in under-developed and sensitive areas, especially along the country's borders. But has anybody bothered to explain why human rights and environmental issues are not on the agenda of mainstream political parties? It may also be noted that resources flow to fundamentalist and insurgent groups largely through smuggling and hawala routes. Even if some voluntary groups may be indulging in such activity, with present laws it is possible to pinpoint and punish them. IDEOLOGICAL FEARS: Fear of dilution of ideology has also led to reactions against NGOs. In West Bengal, certain top leaders of the ruling Communist Party of India-Marxist (CPI-M) were reportedly in favour of channeling foreign funds to NGOs through panchayats. CPI-M central committee member Biman Bose recently triggered a controversy by saying that NGOs should be made more accountable and that they should work in tandem with panchayat bodies. Bose's remark indicated the attitude of a section within the CPI-M. It was speculated that foreign aid to NGOs would now be controlled by panchayats. But West Bengal panchayat department deputy secretary Tapan Bandhopadhyay categorically denied that the state government had any such plans. There is no indication of any such regulation being prepared in the near future, Bandhopadhyay added. NGOs are also not aware of any such move. But there is no denying that many politicians in West Bengal resent the growing influence of NGOs in the state. Bose, who himself runs a voluntary organisation called Bankura Institute, and is deeply involved in the literacy movement, has long been advocating NGO accountability, a plea which many feel is not wholly unjustified. Most of the political parties share a certain amount of scepticism about grassroots NGO work. Says Jaipal Reddy of the Janata Dal: "Every NGO is not a Mother Teresa, just as every politician is not a Mahatma Gandhi." Another charge against NGOs is that they are not open in their dealings. Says CPI general secretary A B Bardan: "NGOs are not accountable to the people, whereas political parties and trade unions are. NGOs demand transparency from everybody else, but are least transparent in their own working." Several critical statements of this tone appeared in a recent report titled Foreign Aid and Poverty Redcution by M A Oommen of the Institute of Social Sciences, New Delhi. They indicate a certain amount of intolerence towards NGOs. Political leaders often do not differentiate between genuine social workers, activists and crooks, fust as political ideologies differ, so do the core beliefs of XGOS. Some favour radical social action, others prefer participatory reforms and yet others welfare measures. Instances of physical attack show that progressive organisations with a mass base were targeted, when some politicians were losing their support base. CONTRADICTORY CLAIMS: Despite political opposition to foreign aid, several organisations with strong political backing have been receiving foreign funds under the provisions of the Foreign Contributions Regulation Act (FCRA). A 1995 parliamentary answer to a supplementary question named seven such organisations: the Indian National Trade Union Congress (INTUC), the Hind Mazdoor Sabha, the Anand Marg Universal Relief Team, the Nadwat-ul-e-Ulema (Lucknow), the Vishwa Hindu Parishad, the Friends of Moral Re-armament (Maharashtra), and the Palmyrah Workers' Development Society (Tamil Nadu). Parties which point a finger at NGOs for receiving foreign funds are quiet about their allies receiving money from the same sources. Corruption has been another stick to beat NGOs with. Smita Nagraj, executive director of the Central Social Welfare Board (CSWB) said in a recent interview to Outlook that running NGOs "has become big business." The CSWB has blacklisted over 3,500 NGOs for failing to submit accounts on projects funded by the board. The blacklist attracted a lot of media attention. However, speaking to Down To Earth, Nagraj clarified that the CSWB blacklist comprised NGOs that have not given accounts for programmes. "It does not necessarily mean that funds were misappropriated by these NGOs." LONG BLACK LISTS: The CSWB blacklist followed the Council for Advancement of People's Action and Rural Technology (CAPART) blacklisting 248 voluntary agencies and endorsing a revised list (as of January 31, 1997) of another 150 agencies made out by other government bodies. CAP ART'S first blacklist, brought out two years ago, mentioned more than 560 organisations. A scrutiny by VANI shows that many of these organisations were named simply on the whims and fancies of the inspecting official or local subdivisional magistrate. The list shrank to 248. Commenting on corruption in NGOs, rural development secretary in the Union ministry of rural areas and employment, N C Saxena, says: "With the increase in funds from states and the Union government, many new NGOs sprang up. Many of these had no vision or commitment. The lower levels of the government may be 20-50 per cent corrupt, but these 'contractor' NGOs are more than 50 per cent corrupt." It is not just corruption, but lavish spending by NGOs that has earned them a bad name. The Archaeological Survey of India could do the same restoration work for one-third the cost that some NGOs would charge, notes a senior bureaucrat. "When the government talks about control, it is all about controlling these 'contractors'," says Saxena.  Contractor-type organisations that have no commitment to the voluntary cause. They have little expertise in mobilising or empowering people and use funds to support themselves and create some assets. "It is absolutely clear," Saxena notes, "that CAPART is not funding organisations of the first two types (i.e., genuine organisations). It is at best funding contractor-type organisations...." With little reach among the people, these NGOs adopt a sectoral approach, depending on the area in which they can easily get grants. Government funding has problems. Finding the right NGO for a programme is the first problem. Assessing its capabilities is another. Thirdly, there is no follow-up of NGOs activities, which leads to poor accountability. Controversial organisations find place in the CAPART list. For instance, a CAPAR'i'-funded NGO was blacklisted by the ministry of welfare. One monitor gave it an adverse report, another found it outstanding. An IAS officer acknowledged that the NGO had committed financial irregularities, but recommended further grants. Anil Singh of VANI comments: "Bureaucratic whims and fancies often decide the status of funding." Often small organisations with limited capabilities are awarded funds to work in new areas totally alien to them. Often, the need for a project is not evaluated. Says an official with the department of rural development: "Voluntary agencies are granted funds merely on the basis of a certificate from the local panchayat." Commenting on a hand-pump project granted to an NGO in Haryana, Saxena notes: "Each village, where the project is being implemented already has a number of hand pumps. Probably there are private tube-wells and even a piped water supply system, on which no information is available." There is little follow-up of government-funded NGO projects. Files often include nothing to indicate the impact of government projects on livelihoods. The list of corrupt government-funded outfits is long. Officials say that several relatives of politicians or top bureau-crats have launched NGOs of dubious status that avail themselves of funds. Retired bureaucrats often act as consultants to guide aspiring NGOs through the maze. TAKING THE DONOR FOR A RIDE: However, swindling is not the monopoly of the government-funded NGOs alone. A senior official of the United Nations Development Programme (UNDP) says that "fly-by-night operators" posing as NGOs have also come up. "Some are experts at presenting tailor-made projects to fit any slot for funding>" he adds. These, then, are the brethren of the contractor-type NGOs, except that they milk international funding agencies. Recently, the Dutch funding agency, the Netherlands Organisation for International Development Cooperation (NOVIB) sought a probe against the Hyderabad-based NGO, Action for Welfare and Awakening in Rural Environment (AWARE), for alleged misappropriation of public funds. Set up in 1975 by civil servant-turned-NGO activist P K S Madhavan, AWARE has reportedly rehabilitated 15,000 bonded labourers, recovered 20,000 hectare rightfully belonging to the poor, and taken up sustainable development measures in 300 villages in Andhra Pradesh. Madhavan took to politics and unsuccessfully contested from Kalwa-kurthy assembly constituency in 1994. He has been accused of diverting funds for political activity. Madhavan defends his case, saying that that NOVIB dragged AWARE to court because a new set of officials in the agency insisted on having a say in all activities of the NGO, "but we would not like them to dictate terms to us". While the case continued, on January 15, 1998, the Delhi High Court restrained AWARE from disposing of any property or incurring any expenditure other than for routine work. In fact, what attracted the attention of the authorities was the misuse of tax relief provisions by business houses. "Eager to evade tax, almost all big business houses are now floating trusts," says a highly-placed source in the Income Tax Office (ITO), New Delhi. The worst part is, as he says, "Almost all trusts and big hospitals in the country are flouting income tax norms with impunity," "It has become a good method to divert black money for other works," says a senior official. Shankar Ghose, head of National Foundation of India, a New Delhi-based NGO notes that even "five-star" hospitals run by industrial houses like Escorts and Apollo in New Delhi, avail themselves of tax benefits. Many such expensive hospitals are registered as trusts for tax advantage. Business houses use legal loopholes. The modus operandi usually followed is: a business house donates its money to a trust launched by its owners or their close relatives. The trust shows in its accounts that the money has been collected for charitable purposes. On book, these "donations" amounting to lakhs of rupees, can be shown as instalments of, say, a few hundred rupees each. The business firm gets tax exemption for the "contribution"; the trust gets tax exemption for the money it receives. Financial experts note that this practice is quite common. There is no provision under the existing Income Tax Act to check it. Hospitals often call themselves research organisations, to attract several benefits including exemption of duty for import of equipment. "Many centres do not conduct any reserch work," says a senior doctor. Several cases have been registered against hospitals and charitable organisations. In 1997, the IT department initiated an investigation against Batra hospital in Delhi, IT officials note. However, the case was closed due to "heavy pressure", tax authorities point out. There is no doubt that all is not well with the NGO sector. But the Indian government does not know how to deal with NGOs. On the one hand, it encourages them, on the other it hampers their work. The ministry of environment and forests (MEF), the ministry of health, and various departments ranging from social welfare to rural development have sought NGO participation in various development projects, involving crores of rupees. But recent government moves indicate that bureaucratic control over NGOs may increase and hurt the NGO movement. The government has suggested various control measures. On March 10, 1997, erstwhile Union Welfare Minister B S Ramoowalia stated in Parliament that a proposal to set up a committee to study the functioning of NGOs was under "active considration". India Today reported in November 1997 that the prime minister's office had asked the Planning Commission to set up a panel to monitor NGOs. TIGHTENING FCRA NORMS: In fact, monitoring is already on. The home minister in I K Gujral government, Indrajit Gupta, asked state governments to give a report on all NGOs receiving foreign funds. FCRA has provisions that can be used to control any organisation that receives donations. Already, the government has made it tough to get new FCRA registrations. Asked about the government's apprehensions about NGOs, the home secretary said: "There is no apprehension. Some security measures have to be taken." Significantly, bureaucrats often miss the crux of the matter differentiating between genuine NGOs, which are crucial in even in troubled areas, and front organisations of insurgents and fundmentalists. SOCIETIES ACT, IRRATIONAL MODIFICATIONS: Existing laws are flexible enough to stifle even well-meaning groups. NGOs are still governed by the Societies Registration Act, 1860. State governments often irrationally modify various provisions of the act to control NGOs. In Uttar Pradesh, there is a provision requiring renewal of registration every five years. In Tamil Nadu, the government can supersede the governing body of any organisation without notice and seize its property. In Maharashtra, societies have to be additionally registered under the Trusts Act. NEW TAX LAWS ON ANVIL: Another measure of control are the new taxation proposals. Till now, hospitals, educational institutions and charitable trusts were given specific tax exemptions. But the Expert Group for Simplification of Income Tax set up by the I K Gujral government proposed that many of these benefits be withdrawn. Current tax laws allow trusts and societies to build up their corpus and ensure sustainability of their work by transferring their annual income to the corpus, without attracting income tax. The provisions of Section 11 of the Income Tax Act allow a trust to accumulate the entire income without attracting income tax for "charitable or religious purposes". But income can be accumulated only for specifice purposes. If an NGO has to carry forward over 25 per cent of its annual income, it has to make an application to the assessing officer, stating the purpose. Another important proposal is that organisations enjoying tax exemptions should not carry on a business that is not integral to their charitable objective. For instance, it could be argued that an organisation whose objective is to provide shelter to children has no business selling greeting cards or rent out its community hall. In practice, this may be an important income-generating activity for a group to remain self-reliant. Anil Singh of VANI sees the proposals as means to harass NGOs. "Whatever money we get is counted as 'income'. It is like taxing a business organisation for its net receipts or a contractor for the project cost," remarks Singh. He argues that corruption and misuse of funds can be easily tackled under the existing laws. Increased tax and fund cuts will only add to the burden of NGOs that go by the rule book. EXTERNAL AID THROUGH THE GOVERNMENT: One of the most controversial government moves had to do with foreign funds. The department of economic affairs (DBA) of the finance ministry is tightening control over foreign funding of NGOs. According to senior NGO activists, bureaucracy has been trying to make a change in the pattern of foreign funding for NGOs for some time. The technical aspects for this control were taken care of in 1996. According to an office memorandum (August 30, 1996) issued by the deputy secretary (budget) in the DBA: "All bilateral official grants will be routed through the Union budget, except in the case of central public sector undertakings and autonomous bodies which are substantially financed by government." In NGO circles, there is stiff criticism of this move. Under the new rule, if a major project has to be funded by an international donor, there has to be a provision for it in the Union budget. A corrupt system breed corrupt NCOS. Avdhesh Kaushal, chairperson of the Rural Litigation and Entitlement Kendra, Dehradun, says that the move to channel foreign funds through government budgets is absurd. "It will breed corruption, encourage bureaucratic controls, and increase the burden on the environment." According to him, MEF officials have placed hurdles before forest-related projects involving people's management. Environmentalists' experience shows that bureaucrats often insist on a role for themselves when bureaucracy actually needs to reduce its workload. Already, undue delays in obtaining clearance for proposals submitted to various ministries are common. Yet, the bureaucracy cannot ensure that the projects are implemented by genuine groups, Saxena notes. Some of the major donors have changed the mode of funding. Beginning from the 1997-2001 funding cycle, the UNDP will fund NGOs through the government. It will be programme-based approach, instead of the earlier mode of funding individual projects proposed by NGOs. UNDP officials explain that it puts the "priority of the government first." Says a UNDP spokesperson: "The UNDP mandate is to assist national governments." Says Pradeep Monga, the UNDP official dealing with the Global Environment Facility: "It is an evolutionary process. The project approach was too focused, it lacked flexibility." However, a section of NGOs- sees the DBA move as one more way to control them. Says an activist, who was shuttling between the donor and the MEF to clear a project proposal: "It is a clear case of the government tightening control over funds." COMPARING the strengths and the weaknesses of NGOs is not an exercise in futility. Economists have noted that the efficiency of non-profit organisations cannot be compared with efficiency in business. Increasingly, however, those who have, an eye on foreign and government funds are setting up organisations that are labelled NGOs. This includes healthcare and other areas that, in the absence of suitable infrastructure in India, are clearly money-making ventures. This has been noticed by funding agencies as well as Indian tax authorities. Agencies such as the UNDP, World Bank, and some bilateral donors increasingly view private financing as the key to poverty reduction and development. The tax authorities, on the other hand, have -sought to impose new rules to check misuse of funds. But this is only likely to hamper the work of genuine NGOs. If the government actually wants to check corruption, it could ensure that the existing laws are implemented properly. It could identify NGOs with a clean record and seek their help' in making a list of voluntary organisations that are known for : their work. But first, the government should differentiate'? between NGOs that perform a social service without seeking profit and those that function in areas that are profit making. Any organisation which is not part of government is an NGO. Excluding profit-making private organisations, academic, institutions, funding bodies and government-sponsored, organisations set up under the Societies Act, the term NGO still encompasses many types of organisations. The World Bank definition, accepted by most funding agencies and governments, includes all those "private organisations that pursue activities to relieve suffering, promote the interests of the poor, protect the environment, provide basic services, or undertake community development." That the nature of the work does not involve profit is clear enough, The bank notes that 'altruism' and 'voluntary work' remain key; characteristics. NGOs have been playing an important role in Indian rural life for more than 50 years. But they have changed over the years. The low-key, peaceful style typical of Gandhians was overtaken in the turbulent 1970s, with students and peoples' agitation against corruption and political'tyranny in several states. Many were inspired to drop out of professions and take up the cause. The Indian NGO movement flowered. NGOs became partners in government programmes on a wide scale in the 1980s, During Rajiv Gandhi's tenure as prime minister, NGOs became involved in many rural development programmes. The trend became stronger in the 1990s, with many Indian NGOs gaining international status. Crores of rupees are spent through NGOs for government programmes ranging from rurkl development to women and child welfare. Says UNDP assistant resident representative Bhaskar Bhattachatrji: "UN organisations have been evolving a strategy for greater NGO participation, especially in the 1990s." He notes that right from 1990, world summits ensured NGO involvement. Country representation in international forums is no longer a monopoly of governments. DECLINING AID: But everything has not looked up. 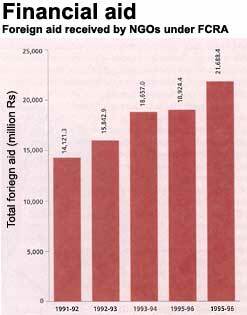 Aid flow to India, compared to other low-income countries, has declined by 5.9 per cent per annum between 1985 and 1995. "The situation could dramatically worsen if the threat to take India out of the category eligible for Overseas Development Assistance of which it is by far the single largest recipient materialises," notes Binu S Thomas, coordinator, policy and advocacy unit, Actionaid India. 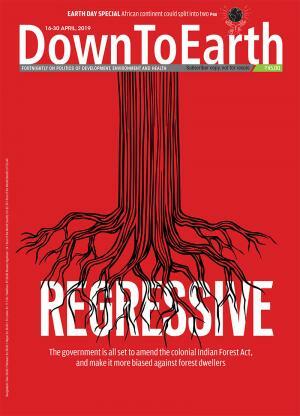 The government moves to channel funds, amend taxation rules and control FCRA registration has added to the resource crunch faced by many NGOs. Channelling funds through the Union government would mean greater scope for bureau-cratic control and misdirection of funds. It would allow government interference even in clearance of project funding. CHANGING EQUATIONS: Even self-criticism in the NGO community is not pragmatic. There has been a move from within the voluntary sector for a code of conduct and tighter controls. But the debate appears to have become a forum for mutual accusations between rural and urban NGOs. In a vitriolic open letter to the Union home minister, published in the Economic and Political Weekly (December 7, 1996) noted NGO activist Bunker Roy, who heads the Social Work Research Centre in Tilonia, Rajasthan, said that there was an urgent need to amend the FCRA. According to Roy, the FCRA should favour grassroots groups, and exercise greater control over rich urban NGOs and advocacy groups. Over Rs 2,000 crore come into India every year from foreign donors for rural development. Roy noted that with so much money coming in and no public accountability, some groups are building colossal empires, and the spirit of voluntarism is slowly getting destroyed. While there may be some truth in what Roy had to say, it was an extreme position. The NGO sector is more complex than ever before. Different organisations perform valuable roles. The focus of NGO activity has shifted constantly in the past three decades. By the late 1980s, many NGOs were taking up policy issues with the government, with varying levels of success. Says Atreyee Cordeiro of the Society For Participatory Research in Asia (PRIA): "NGOS are coming of age. They are responding to the changing needs ot the time. Their agenda has been to bring about social change. For that, advocacy is a vital aspect now." The move for further bureaucratisation is contrary to the mode of planning promoted by the government, involving people, and with less stress on bureaucratic necessities. The Planning Commission has stressed "participatory development", with involvement of Panchayati Raj institutions, NGOs and people at large in planning. There is need for a serious debate on these issues. But there are no quick-fix solutions. Promoting trust between NGOs and the government is also important. There are suggestions for screening bad NGOS. An accreditation system that would make a recommendation from a reputed NGO mandatory for government funding has been mooted by N C Saxena. "Ask reputed NGOs to prepare a list. The list should be updated from time to time." Saxena notes that half-hearted measures towards people's participation have only resulted in wastage of funds. He criticises the 'we manage, you participate' thinking in many development schemes taken up by the government. So, the government needs to think beyond blacklists and blanket controls. There is a need to come out with an open, comprehensive policy for NGOS. The latter, on their part, should refrain from thumping their chests and engage in mud slinging at one another. They need to evolve a strategy to ensure accountability and commitment to the people's cause.